Columbine is easy to grow and tolerates a wide range of conditions. Red and yellow 1"-2" lantern-shaped flowers are hummingbird magnets. Under favorable conditions Columbine spreads readily. Larval host plant for a cute little butterfly, the Columbine Duskywing. Grown from Kentucky-source seed. 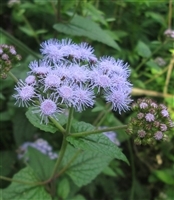 This robust plant attracts and supports many pollinators. It spreads easily by rhizomes. Common habitats include dry fields and along roads, provided they are not sprayed with herbicide. Larval host for the Monarch butterfly. Grown from Kentucky-source seed. Lovely accent plant for late-season color and nectar. Excellent for container gardening. For home use, containers or planting in a contained area is recommended as Mist Flower spreads easily. Grown from Kentucky-source seed. Wild or Virginia Strawberry has white flowers which provide early-season nectar. Decorative in a hanging pot and effective as a ground cover as it spreads readily by stolons. Having high ecological value, it provides early season nectar, pollen & serves as a larval host plant. Provenance: Kentucky. 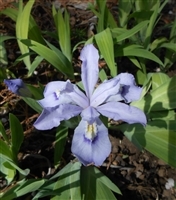 The leaves are sparse and small, making the entire plant appear to be a bountiful bouquet. It has a long blooming period. If left standing, the dried seeds support many birds in winter. Under favorable conditions, this plant grows large and spreads readily. Grown from Kentucky-source seed. White to pink tubular flowers fill the flowering stalk, attracting bees, butterflies and hummingbirds. Makes a lasting cut flower. Spreads readily. Consider using in contained situation for home garden use. Also called American Agave, this plant has a basal rosette of flat, fleshy leaves. The flowers, both interesting and fragrant, are borne on tall slender stems. An excellent drought-tolerant plant for a dry sunny spot or rock garden. Grown from Kentucky-source seed. A showy true sunflower which serves as a larval host to over 70 Lepidoptera (moths & butterflies). The foliage is "ashy" or grayish. The seed heads are a favorite of local birds in autumn. Best placed where it is free to spread or grown in pots. Grown from Kentucky-source seed. 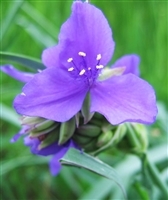 Clump forming plant with interesting bluish-green foliage & bright blue-purple flowers. Spreads vigorously under ideal conditions. Belonging to a family of primitive vascular plants, this plant does not flower but forms cone-like heads that bear spores. Evergreen stems provide very interesting visual texture in all seasons. Be forewarned that containment in a large pot is highly recommended for home use of this plant. It can spread aggressively by rhizomes, even bypassing pavement underground to colonize new areas. A clumping semi-evergreen plant with an interesting spreading vertical habit. 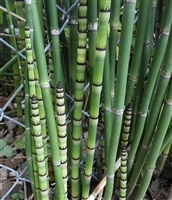 Use in areas in need of erosion control & in water gardens, container gardens, at pond's edge or other damp areas. Spreads under favorable conditions. Grown from Kentucky-source seed. Hardy & unique, this trailing succulent is ideal for use as a ground cover, in a window box or rock garden. Good source for early-season nectar. Drought-tolerant once established. 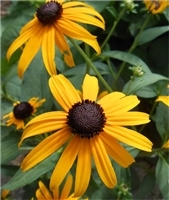 A pleasing clump forming plant bearing bright & bold yellow-orange blooms that last for weeks. Great as a cut flower, for use in rain gardens & massing to create a border. Remove spent flowers to prolong bloom time. Spreads by rhizomes. Grown from Kentucky-source seed. 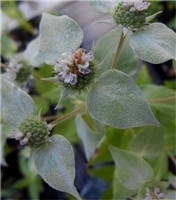 Also called Short-toothed Mountain Mint. In mid to late summer flowers are subtended by gray-silver bracts & are lovely en masse. Foliage is minty aromatic. Vigorous grower. Grown from Kentucky-source seed.